Jacub Gagnon is a Canadian artist, known for combining seemingly incompatible elements like animals and objects, therefore, creating catchy and wonderful Pop Surrealist paintings. His art exceeds the common rules of the natural world and enters the parallel universe of unreal and unnatural. This interconnection is based on elusive, almost chaotic order, where physical laws are barely visible, and everything is possible. Jacub emphasizes the multi-layered relationship between the unknown and enigmatic, craftily transforming it into the hyper-real with his highly detailed artwork. His goal is to elicit various reactions and feelings from the viewers like curiosity, wonderment, smile, and self-questioning, pretty much all thoughts are welcome. The artist was born in 1987 in Canada, where he received BFA in Drawing and Painting at the Ontario College of Art and Design in Toronto, in 2009. At the beginning, Jacub’s work was influenced by Salvador Dali, but then his professor encouraged him to find his own style. During the studies, he met Sarah Joncas, who inspired him both as a person and as an artist. Gagnon immediately felt the connection with her work and was impressed with the level of details she achieves. 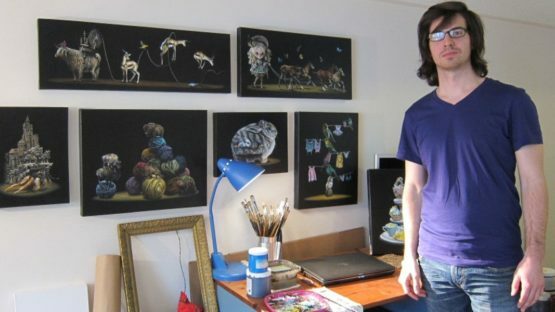 There are other contemporary artists from whom he picks up certain techniques and applies it to his artwork. For example, he admires Greg Simkins for his ability to paint anything he can visualize, Joe Sorren and Sainer for their amazing palettes, and Essao Andrews for the vibrant and ingenious subjects. Thanks to the contrast in light, the attention to details in execution, and the richness of minutiae, Jacub art transcends all expectations. Unique luminosity is achieved through the use of layered acrylic paints and by applying tiny brushes. The precision of his art can be seen in numerous combinations and unpredictable distortions of scale. Until recently, most of the narratives were created through the implementation of dark black backgrounds, to which subjects were added. However, Gagnon has decided that there are other possibilities if he uses other colors, such as white. His experiments continue by incorporating empty and nondescript spaces that leave the feeling of disbelief and contextual ambiguity. The artist tries to tell a story of the world, which is both nice and bad, through the concept of interconnection between human and nature. Thanks to the extraordinary talent, author’s works seems as if they were done with pencils and not small brushes. His seemingly illustrative quality paintings, made in Pop Surrealist style, put the issues of habitat and species of today, into another dimension, through his imagination. Jacub’s pieces can be seen in various cities and galleries throughout USA and Canada, like at the Thinkspace Gallery in LA, or at the 12th Annual Figurative Show in Toronto. His works were also displayed in Florence and London. The artist is represented by the Thinkspace Gallery in LA. Jacub Gagnon lives and works in Toronto, Canada.